Forest of Dean Wildlife & Nature Diary: Some Pretty Hairy Comments!!! 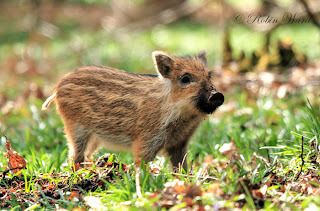 Below is a link to a recent article in the Citizen Newspaper on wild boar numbers and diggings in the Forest of Dean, with some hair raising comments from a local Councillor! The below is from a personal perspective only. I will not make assumptions on population numbers as this will only be pure speculation until we have a more accurate estimate in a few months time. However, I would like to address some of the comments made by Councillor Norman Stephens. "A lot of people I speak to are sick and tired of the boar." Is this a good enough reason to kill wildlife, or ask for it to be killed? "They turfed up the ground around the Forest Church War Memorial just before Remembrance Day." Unfortunately Mr. Stephens, wild animals treat every day the same as the previous, but I am sure that if they did know this they would have indeed shown some respect like us. "The mess at Beechenhurst is deplorable." Again, unfortunately they do not look on this area in the same way we do. In fact, as food is eaten at this location daily, they see it as an opportunity and as a source for food. To them, this "is" the heart of the forest, where they belong. "Road verges have been wrecked." The forest has seen a low natural crop of acorns and chestnuts this last season and to survive, like all living creatures the boar have to eat. One reason why they root road verges is because the verges are soft, which makes life easy for them. Is dirt on the side of the road any worse than the huge slab of tarmac snaking for miles throughout the area? Wild boar are a native species and like it or not they helped sculpt the landscape we see today, many years ago. Wild boar diggings might look unsightly to some, but the reality is that this activity actually revitalises and regenerates the forest. Mr. Stephens has asked for the boar to be contained in a secure enclosure within the forest. Really? And how big should this be; 1, 2, 3, 4 square miles, or more? Even if this was possible, they would require feeding on a daily basis as their territory would be limited. Male wild boar would have to be penned in a separate enclosure while the sows weaned their young. A breach in the fence would see them escape, so this would also need to be monitored on a daily basis. And finally, the Forest of Dean is not a zoo. One day, hopefully, we may learn to respect the fact that just because we walk on this planet, it doesn't mean we own it. We but only share this earth with billions of other living creatures and what we think and see as right, is actually destroying it. What extremely ignorant and blinkered comments he made! Just because animals don't speak our language or live as we do we consider them inferior. I truly wonder if we are actually aliens on this planet because we certainly don't seem able to respect or live peaceably alongside our fellow creatures! I hope you will respond in the newspaper to the councillor Rob. Falls on deaf ears I'm afraid. Unfortunately, as you can gather from the comments he made, we (humans) are the superior race (or so we think) and we make the rules!!! Ignorant comments and attitudes like this is the reason why we are seeing our wildlife decline all over the world.